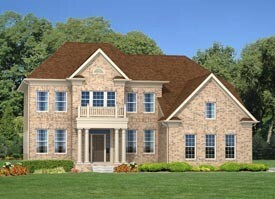 THE LEGATO - Starting from $404,900 4 Bedrooms / 2.5 Bathrooms / 2,900 - 3,300 sq. ft. A winning combination of classic and contemporary, the Legato features a flexible, open floor plan. A dramatic turned staircase is the focus of a two-story entry, flanked by a private study and a formal front-to-back living room and dining room. The island country kitchen is open to a spacious family room with a wall of windows allowing for abundant natural light. Upstairs, almost half of the ample floor space is devoted to the owner’s suite, where a spacious bedroom meets an inviting sitting room. Three spacious secondary bedrooms and a bath are on the opposite side of the home. Square footage from 2,900 to 3,300, starting from $404,900.